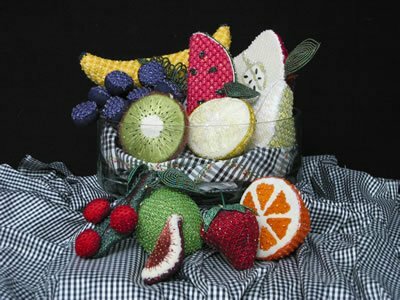 Beaded fruit perfect for a gorgeous centerpiece. Available individually. 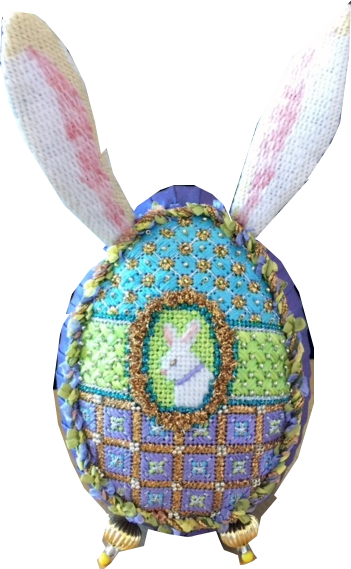 The first of Chandail's exclusive Kirk and Bradley's Bunny Egg collection incorporates beautiful patterns, crystals, beads and a medallion. Try out Wonder Ribbon and Memory Thread. Stitched and guided by Cindy Howland. The second egg in Chandail's exclusive collection from Kirk and Bradley! 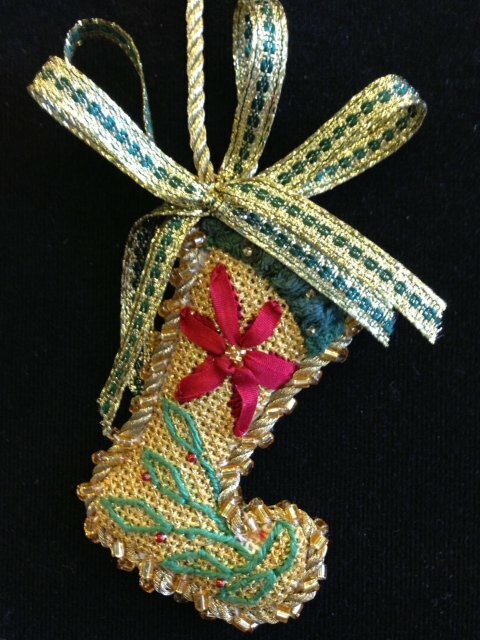 Fabulously stitched by Jan Wilken. 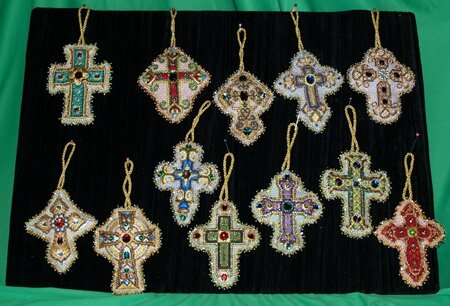 Twelve ornate crosses that are filled with perfect patterns and jewels. Available independently or as a limited time series. 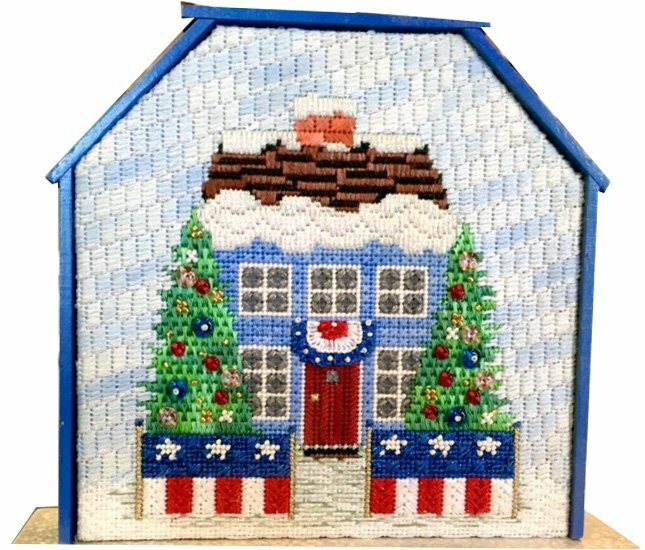 An adorable house all decorated for the Fourth of July! 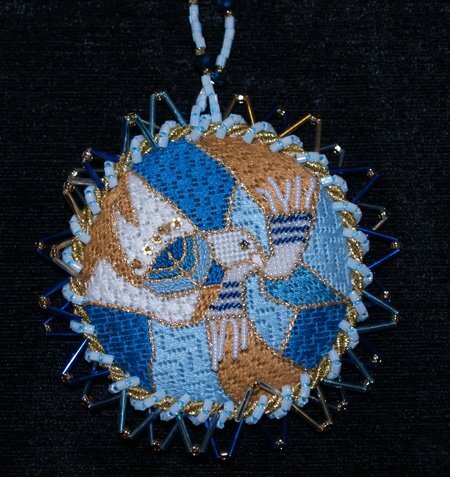 Designed by Sandra Gilmore and stitched and guided by Patricia Sone. 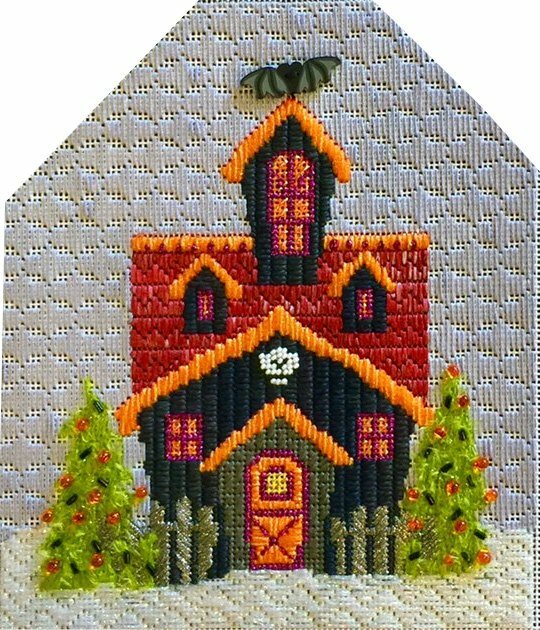 A fantastic Halloween Home stitched and guided by Patricia Sone. Add to your collection of homes! 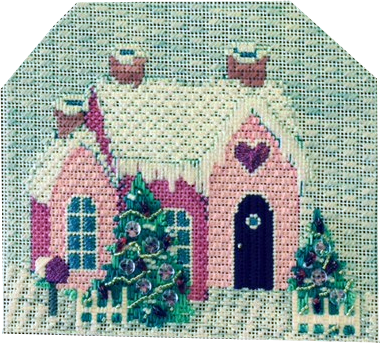 A beautiful house filled with fun patterns and the newest embellishments! Stitched and stitch guided by Patricia Sone. Designed by Sandra Gilmore. 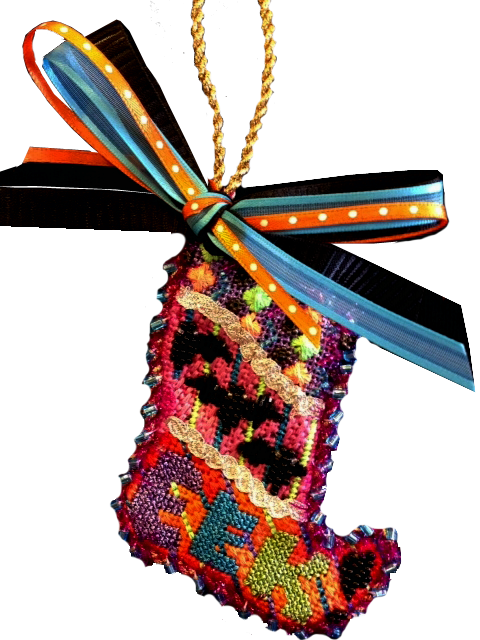 Gorgeous stitch designs with stitch guide by Patricia Sone. 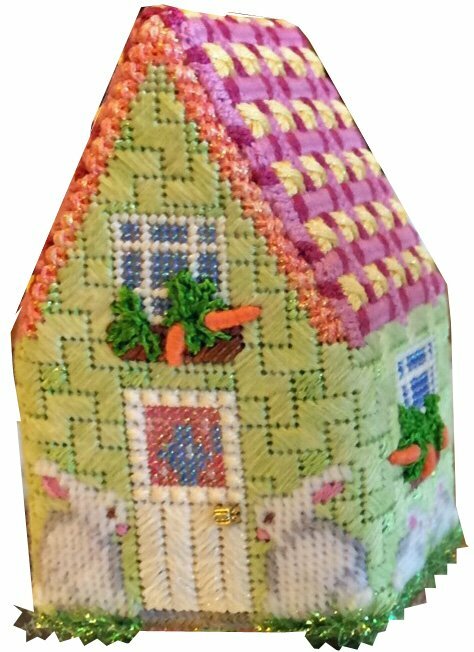 Adorable 3-D Easter House beautifully stitch guided by Jan Wilkens. 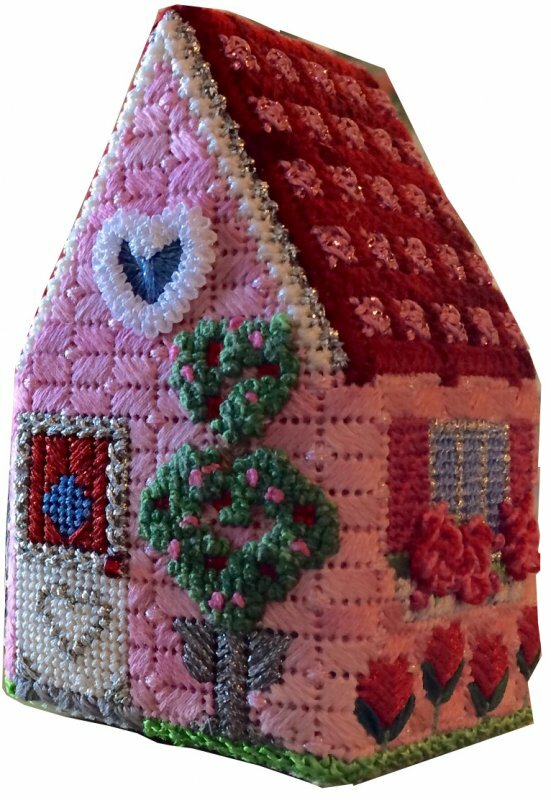 A little 3D house stitched with pretty patterns and fun techniques stitched by Jan Wilkens. 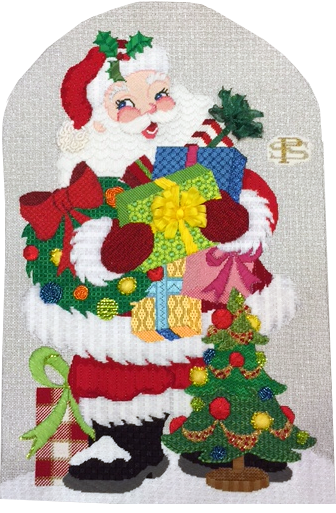 An absolutely adorable traditional Santa stitched and guided by Patricia Sone! Design by Raymond Crawford. 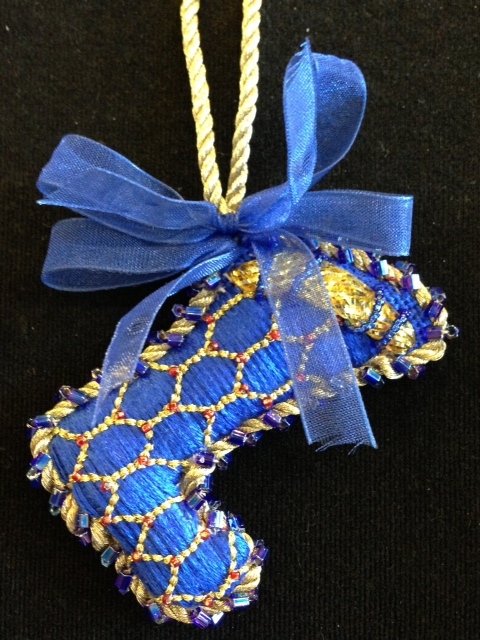 With a stunning beaded bat and exceptional embellishments this boy is fast to stitch! A step by step guide is included. By Kathy Kulesza and Cindy Howland. 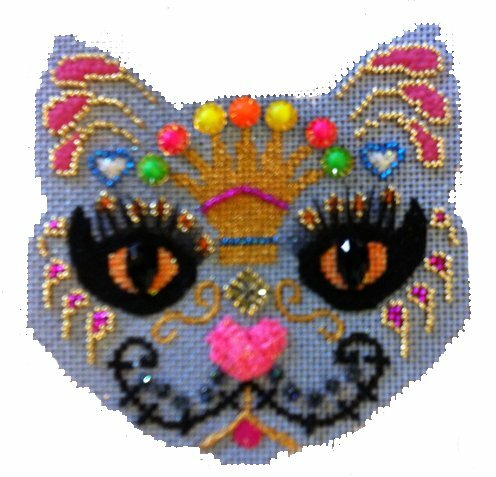 Click on cat to see extra photos of the finishing options! Click on the photo to see the different views and finishing options! Click on photo to see beautiful options for finishing! A gorgeous girl with her eyes and flowers! 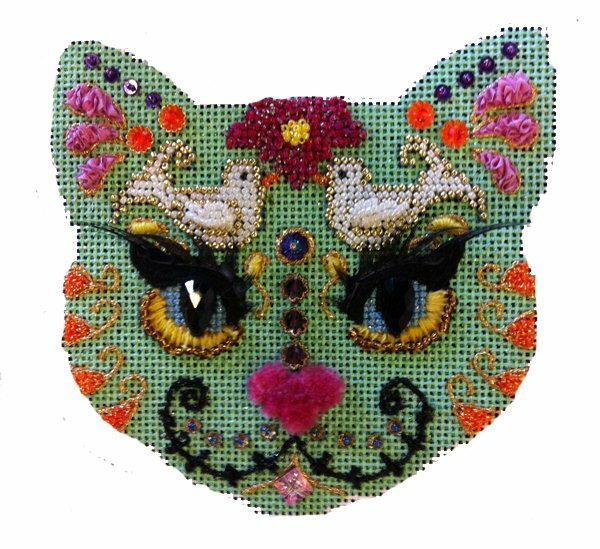 Incorporates completely unique embellishments and is fast to stitch using the step by step instructions. By Cindy Howland and Kathy Kulesza. Click on cat to see extra photos of finishing options. Click on photo to see beautiful finishing options! Click on the photo to see the beautiful finishing options! 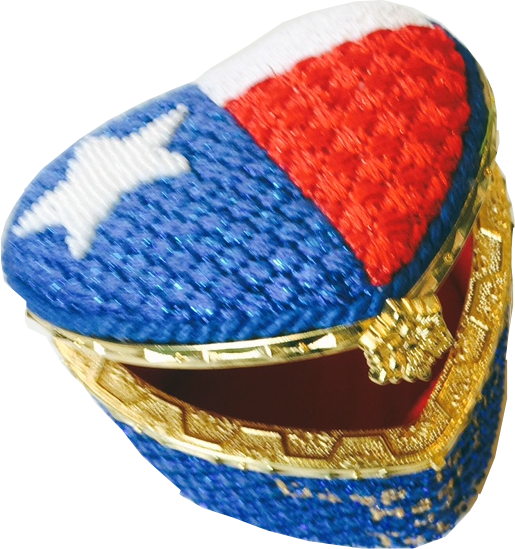 Wonderful to stitch and to have as a Texan! Hinged fitted lid included. 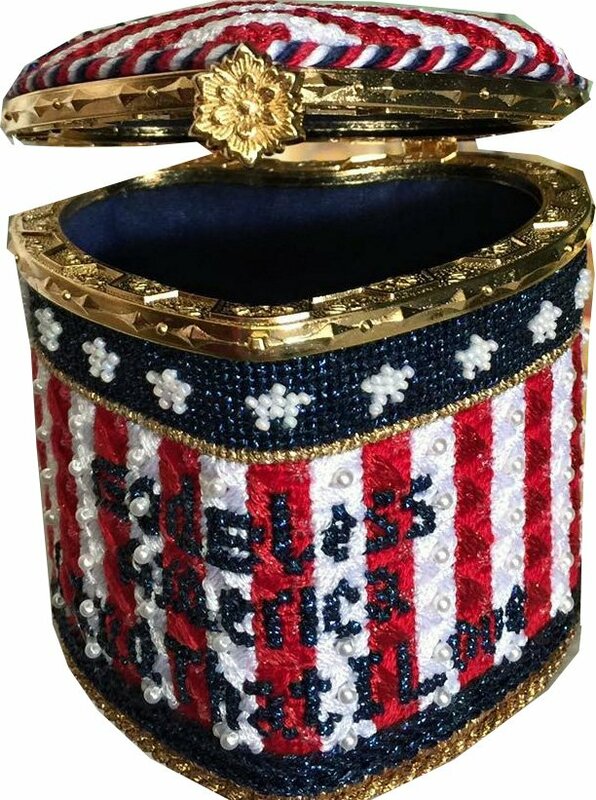 A beautiful and useful accent, the American Flag box top converts into a heart shaped lid using the "Land of the Free" section as the base. 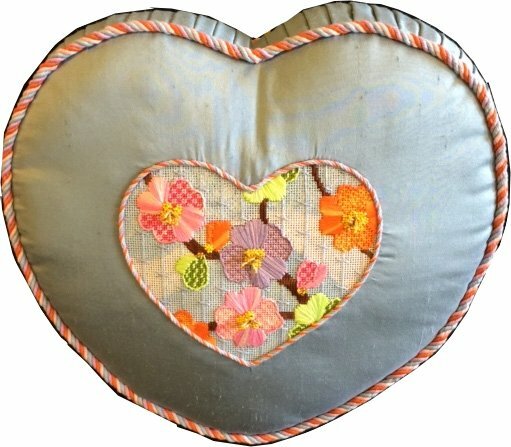 A beautiful and fast to stitch floral in a heart shape. Finish yours as we have as a pillow! 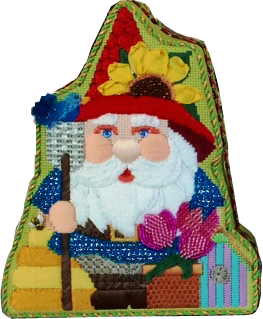 A gnome ready to garden with his ribbon flowered sun hat and hoe! He is also a beekeeper and notice the beautiful blue bird and tulips! 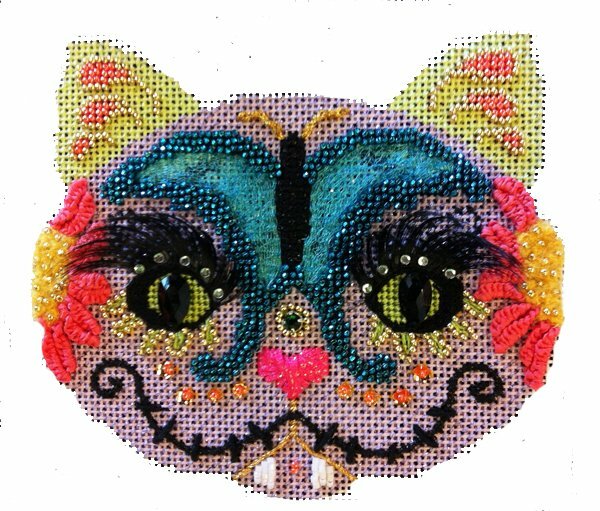 The easy to follow stitch guide is included. By Kathy Kulesza and Cindy Howland. The Gate Keeper leads a safe entry into your garden and home! 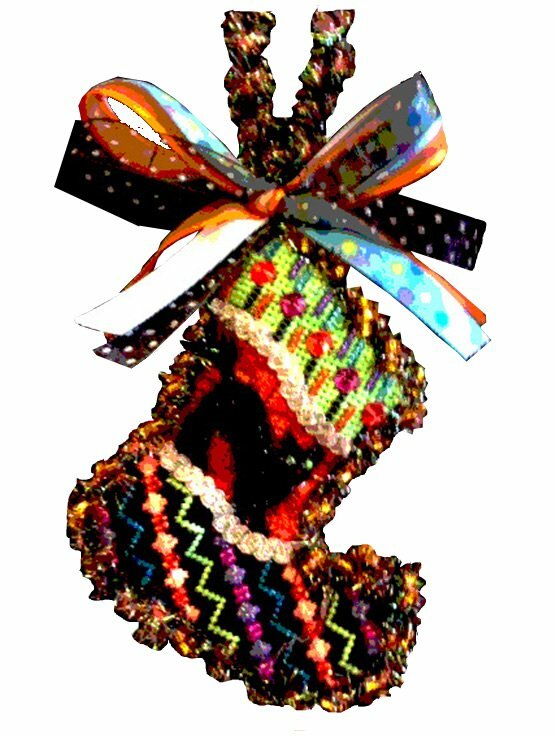 Notice the beaded frog and his eyes! 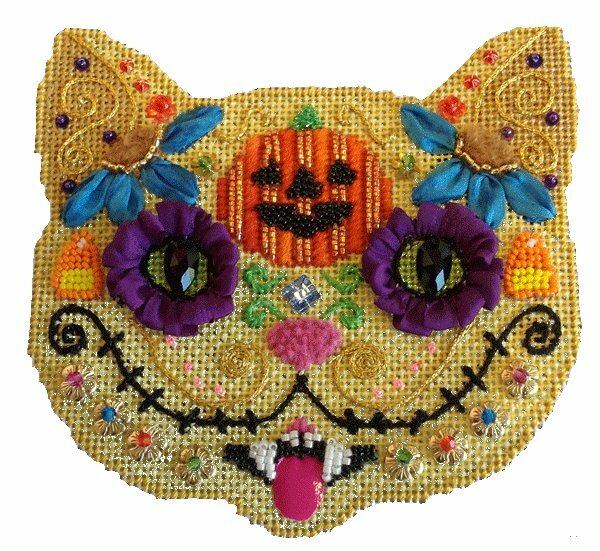 Stitched and guided by Kathy Kulesza and Cindy Howland. 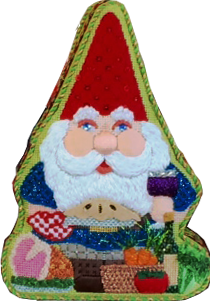 This gnome is ready to serve a gourmet meal and offers a glass of red wine! Notice his pot holder and pie, ham and ingredients for a delectable salad! A step by step guide with photos and descriptions is included. By Cindy Howland and Kathy Kulesza. 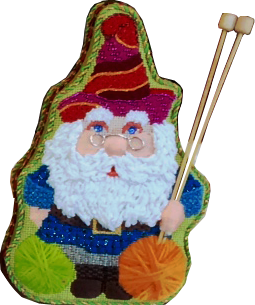 A hobby gnome ready to knit with his choice of yarns! Fun patterns for his coat, hat and his woolly beard are easy to stitch b/c of the descriptive stitch guide with photos. Kit includes the knitting needles! By Cindy Howland and Kathy Kulesza. 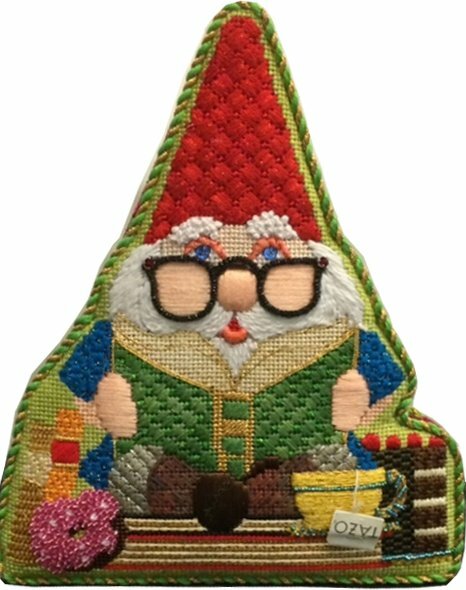 Reading his favorite book while sitting on more, this gnome knows how to enjoy his hobby! Notice his glasses, cup of tea, cake and doughnut! A descriptive stitch guide that incorporates photos is included . By Cindy Howland and Kathy Kulesza. 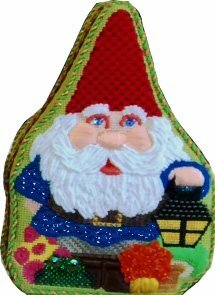 The shopper Gnome has beautiful stitches on each bag and on his clothing and hat. Notice the high heeled shoe and the Chandail name on one bag that can be changed to your initials &/or date! By Kathy Kulesza and Cindy Howland. 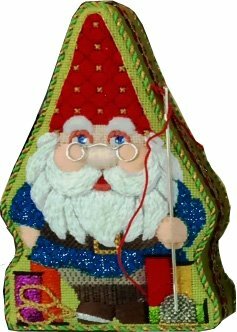 A gnome that befits us all! His needle is threaded and ready to use for stitching! The needle is included. 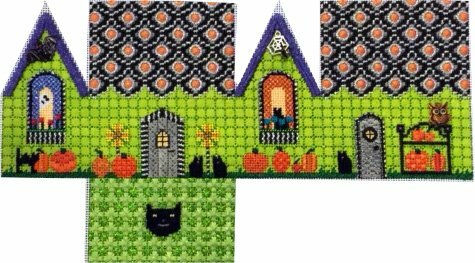 Stitch guide includes photos with step by step instructions. By Cindy Howland and Kathy Kulesza. A graceful dove carrying a Tallit. 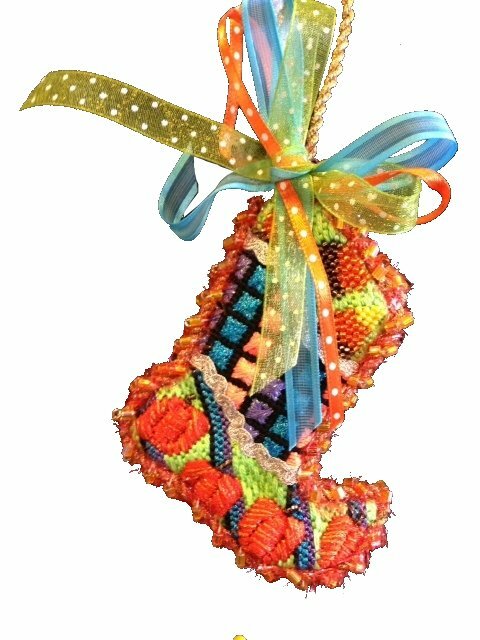 Stitch guided by Cindy Howland and Kathy Kulesza. A 3" round designed by Lee. 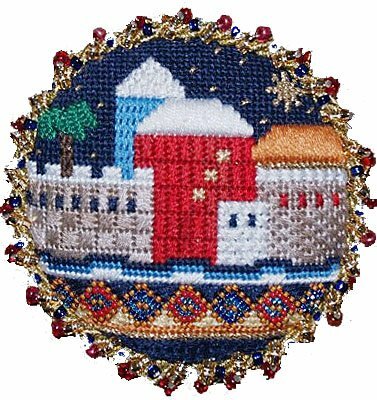 Perfect patterns and beads for a beautiful Holy City ornament. 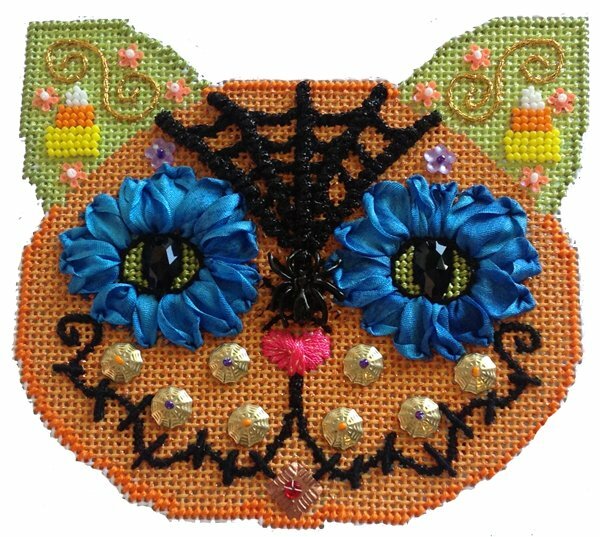 Stitch guided by Kathy Kulesza and Cindy Howland. 3" round by Lee. 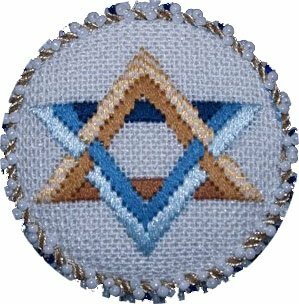 An elegant Star of David ornament stitch guided by Kathy Kulesza and Cindy Howland. 3x3" round by Lee Designs. 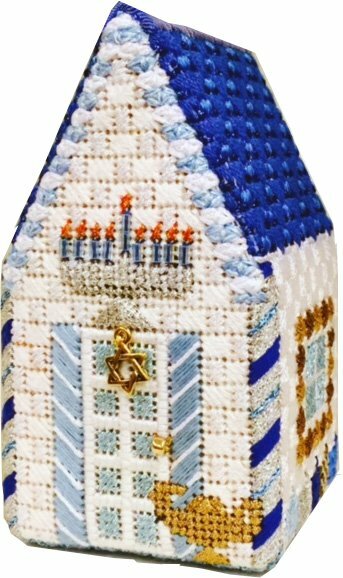 Striking Star of David ornament stitch guided by Kathy Kulesza and Cindy Howland. Designed by Lee. 3" round. 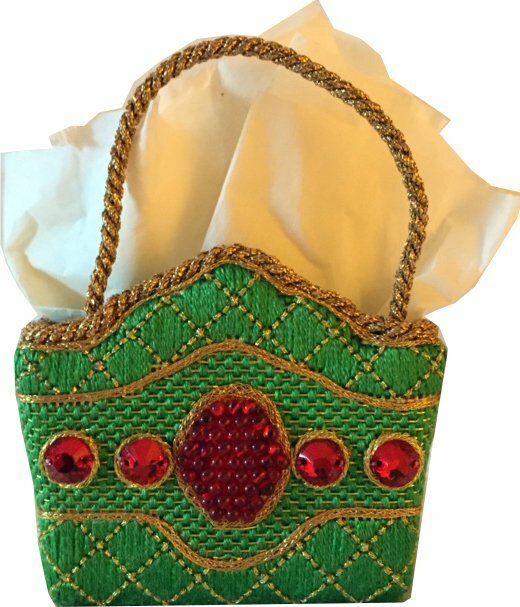 Jewels and beads fill this beautiful tiny gift bag. 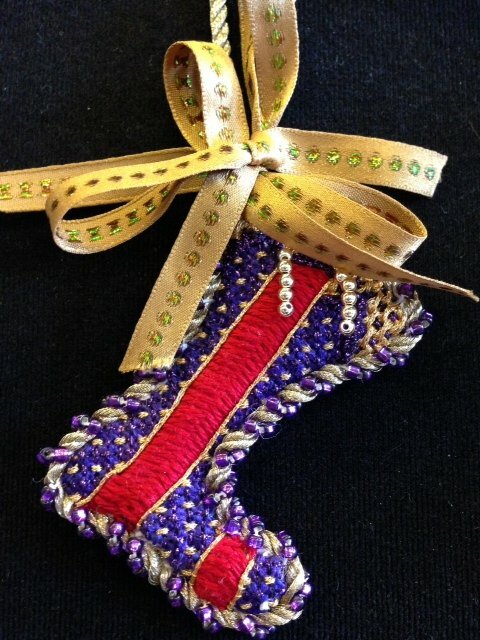 Jewels, beads and fantastic stitches! 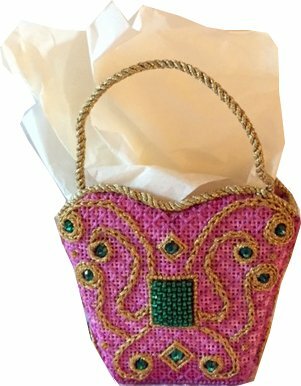 A beautiful tiny gift bag! 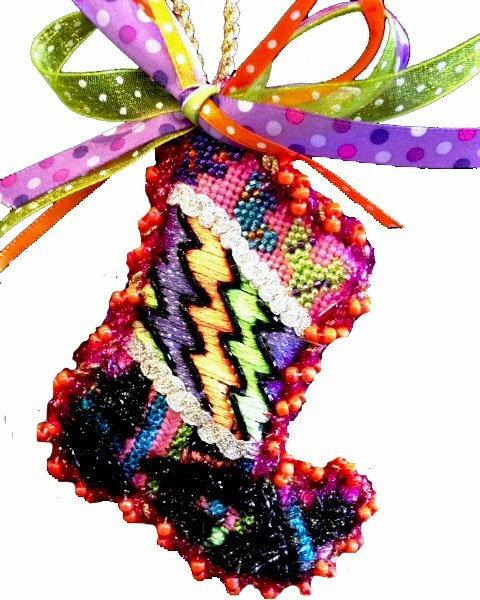 Sized for little accessories or perfect on a tree! 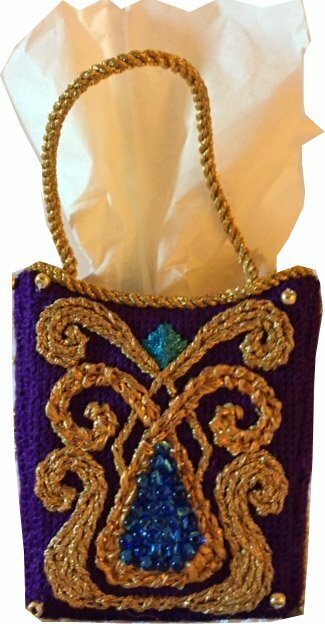 Beautiful beads and gold swirls make up a gorgeous little bag! 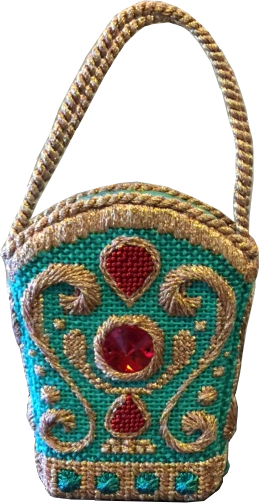 A sparkling little bag with jewels and beads! 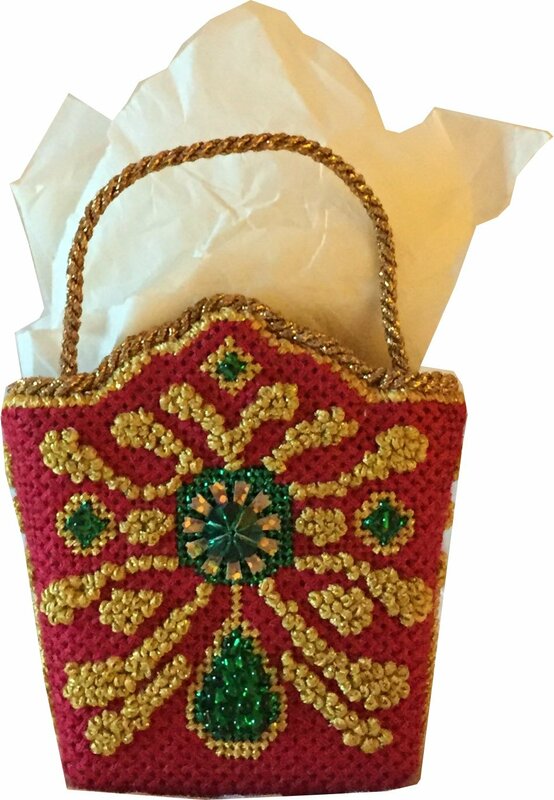 Beads and gorgeous crystals fill this little gift bag! View Large Image Little Halloween Witch Sock: CAT! A scary black cat on a cute little halloween sock. 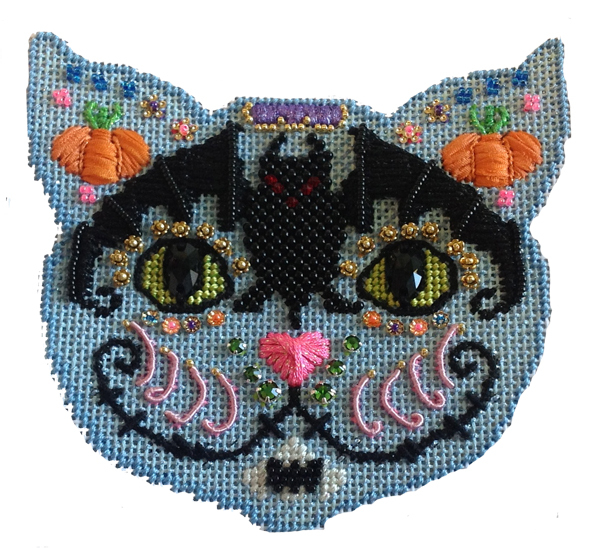 Super fast to stitch! 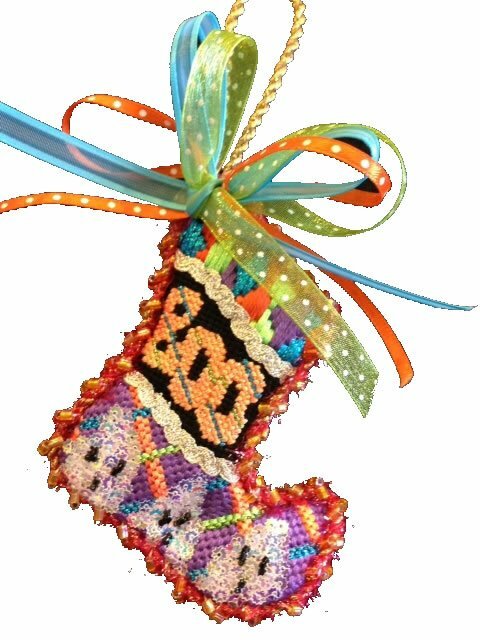 ACOD design, stitch guided by Cindy Howland and Kathy Kulesza. View Large Image Little Halloween Witch Sock: EEK! View Large Image Little Halloween Witch Sock: BOO! 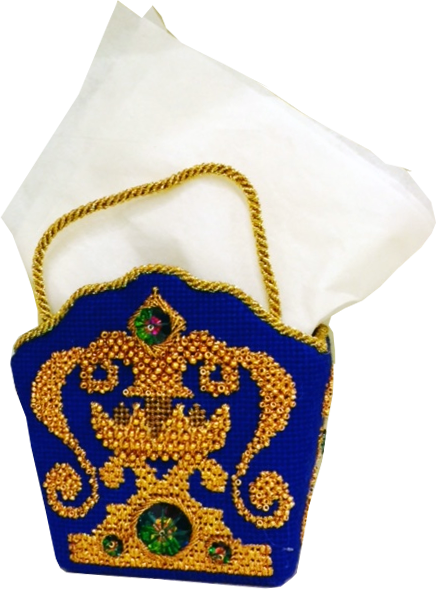 Sparkling witch hats fly on our fun little Halloween sock. 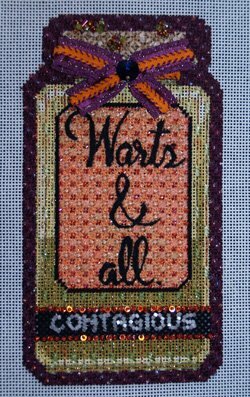 ACOD design, stitch guided by Kathy Kulesza and Cindy Howland. View Large Image Little Halloween Witch Sock: SPIDER! 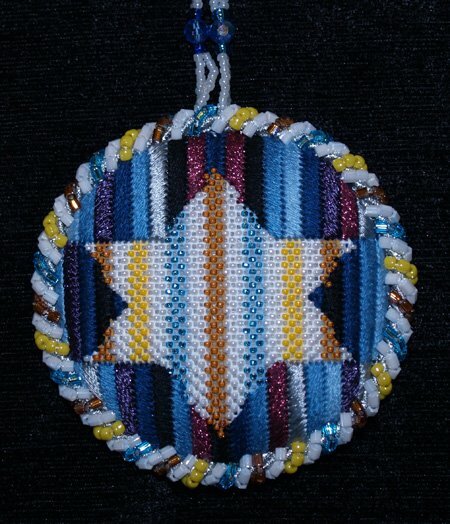 Beautiful patterns create a stunning little ornament. 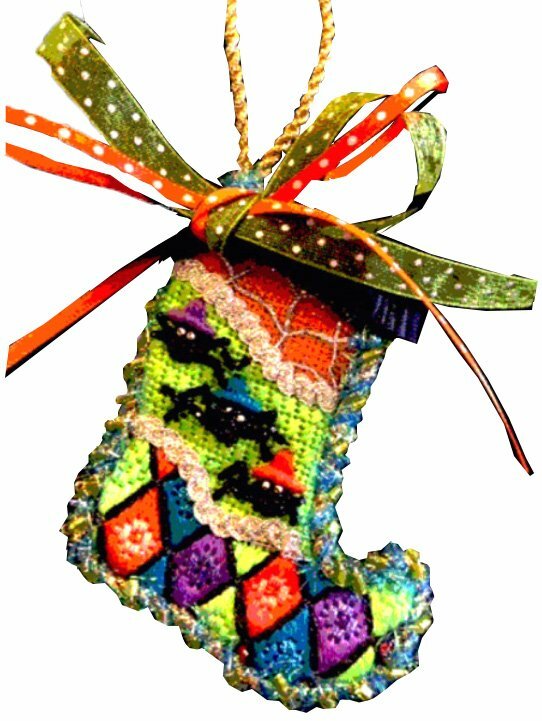 Finished as a sock, it is perfect to hold a little gift! 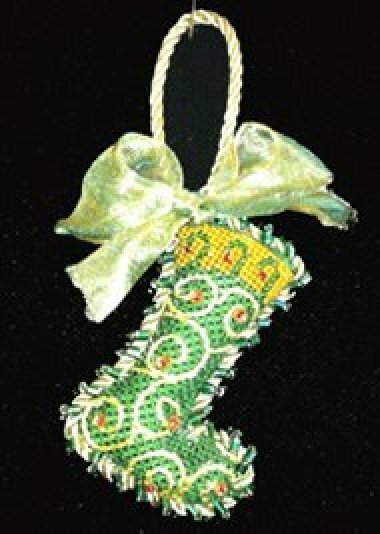 Learn a use for Sparkles, too! 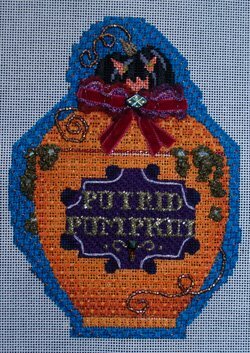 Stitched by Kathy Kulesza, stitch guide by Cindy Howland. 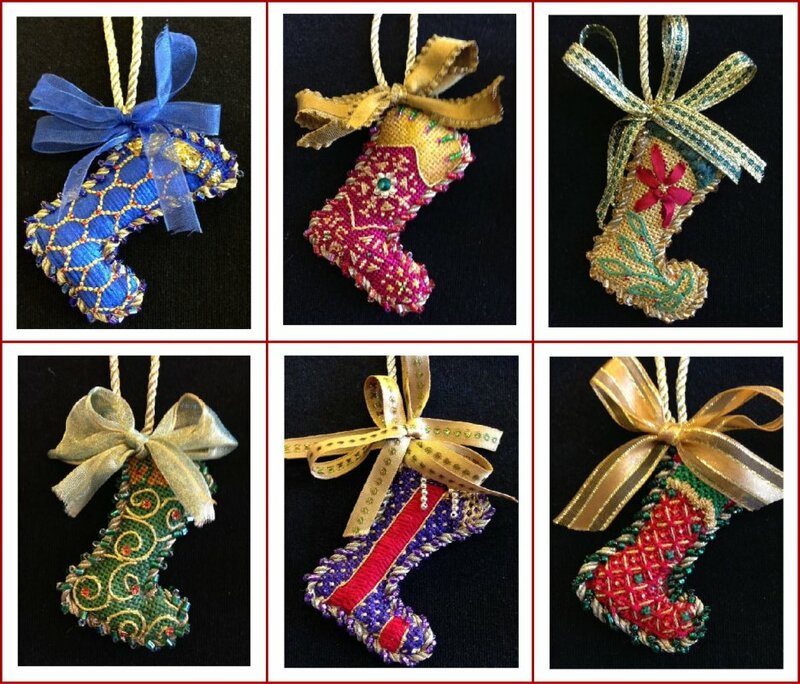 View Large Image Miniature Christmas Socks Individually Kitted. See them All! 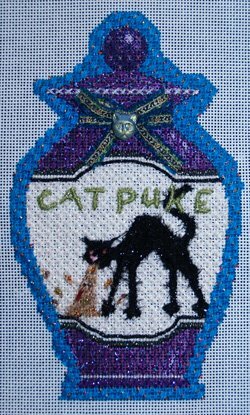 View Large Image Poison Bottle "Cat Puke"
Beautiful patterns adorn our puking cat Poison Bottle! Our Putrid Pumpkin with perfect patterns and realistic bubbling ooze! 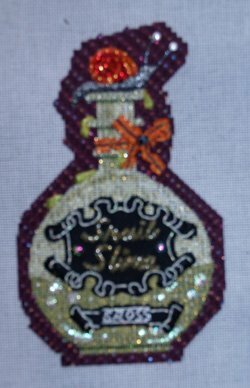 A slimy snail bottle topper adds the perfect touch to the gorgeous stitching patterns! A classically shaped bottle beautifully stitched with warts and all! 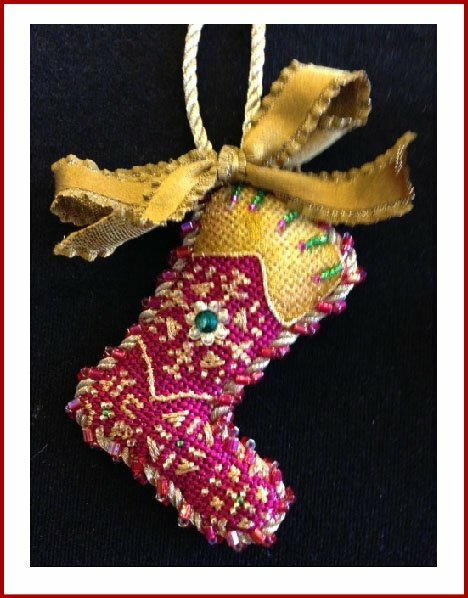 A beautiful Russian doll is complete with jewels and lace! 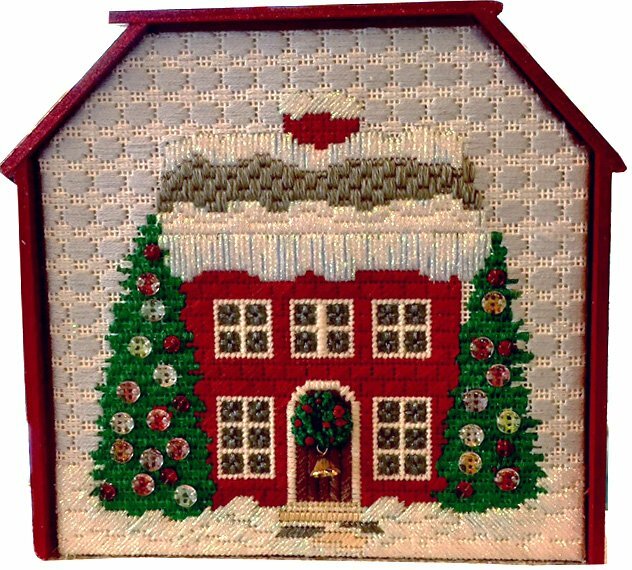 Stitched by Kathy Kulesza and with guide by Cindy Howland. 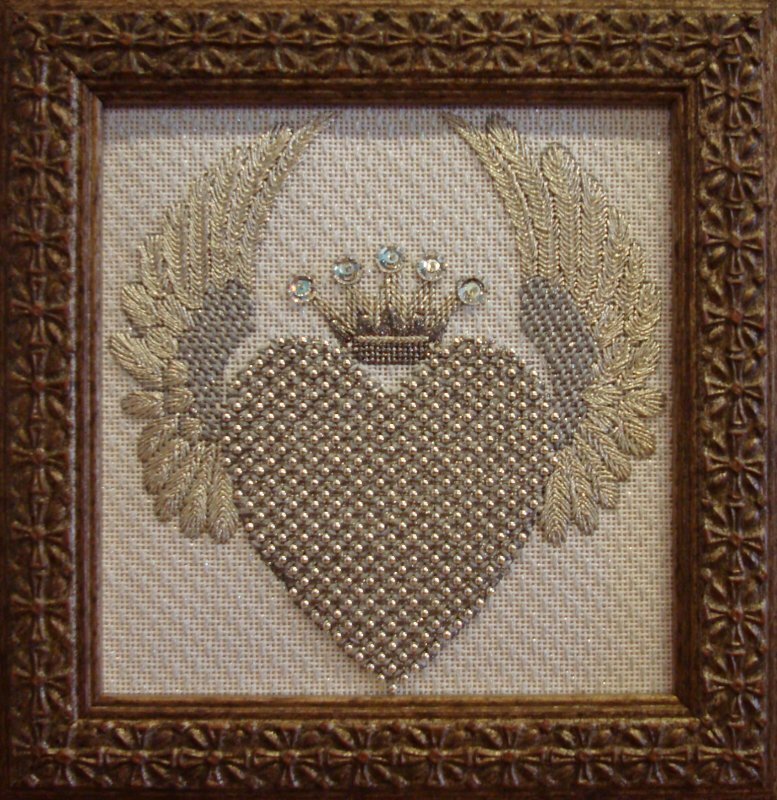 A stunning heart beaded and stitched beautifully by Cynthia Thomas. Design by Ann Wheat Pace. 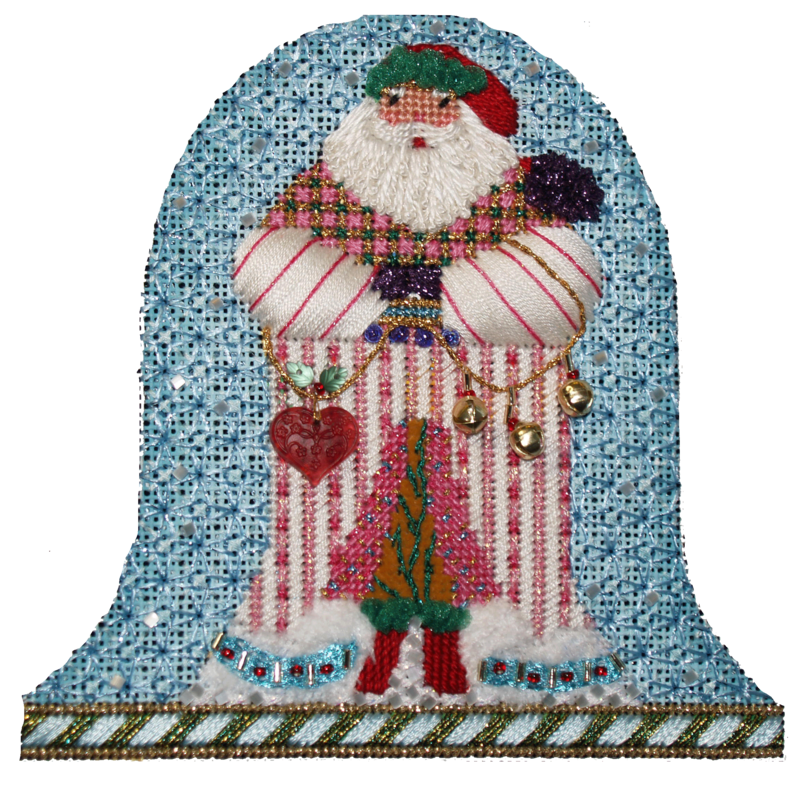 Beautiful Santa dressed in his candy cane suit with fabulous details such as his sleeves and coat patterns! His heart and bells add dimension to his spectacular face and beard! 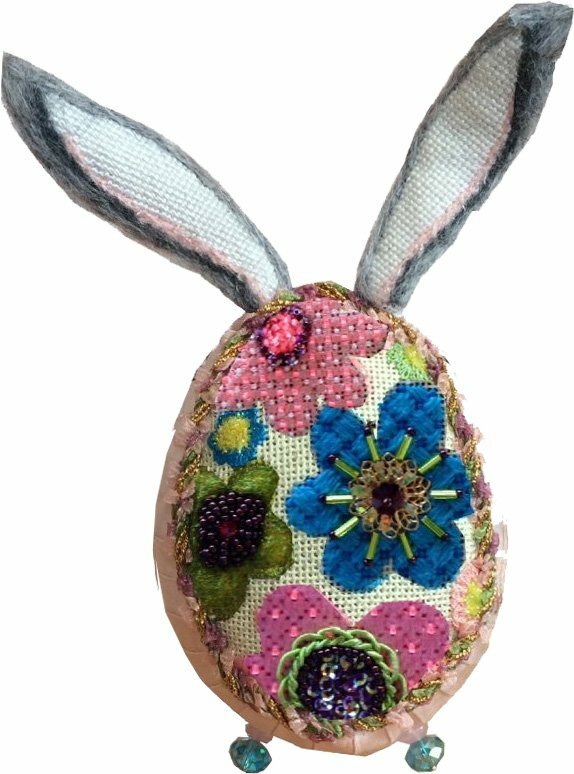 Stitch guided by Kathy Kulesza and Cindy Howland.